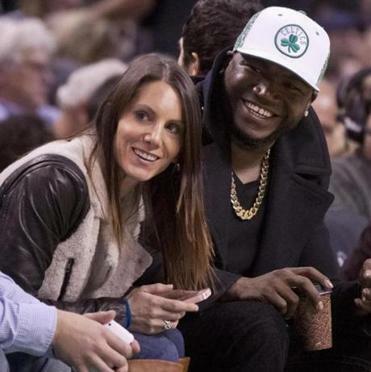 Tiffany and David Ortiz at the TD Garden last year. After nearly 10 years of marriage, Red Sox DH David Ortiz and wife Tiffany are calling it quits. In an interview Monday with MLB.com, Big Papi confirmed something that had been rumored for several months. The couple, who live in Weston, have two daughters, Jessica and Alexandra, and a son, D’Angelo. The Sox slugger said the separation is amicable and he hopes the public will respect his family’s privacy. Since coming off the disabled list earlier this month, Ortiz has been among the team’s most productive hitters. Before Monday’s game, he was hitting .516 with two homers, and 11 RBIs. Attempts to reach Tiffany Ortiz were unsuccessful Monday. On her Twitter account, which is restricted, she identifies herself as “Mother of Alex & D, BFF of Foxxy and the baby Happy. On the Boston board for US fund for UNICEF, Pmc rider, Tree Hugger and Yogi.” There is no mention of David Ortiz.